We have a bunch of company devices (servers, desktops, laptops, company-issue phones, etc). All of these devices are company devices, every employee uses them just for business. All devices should have the same filters applied. 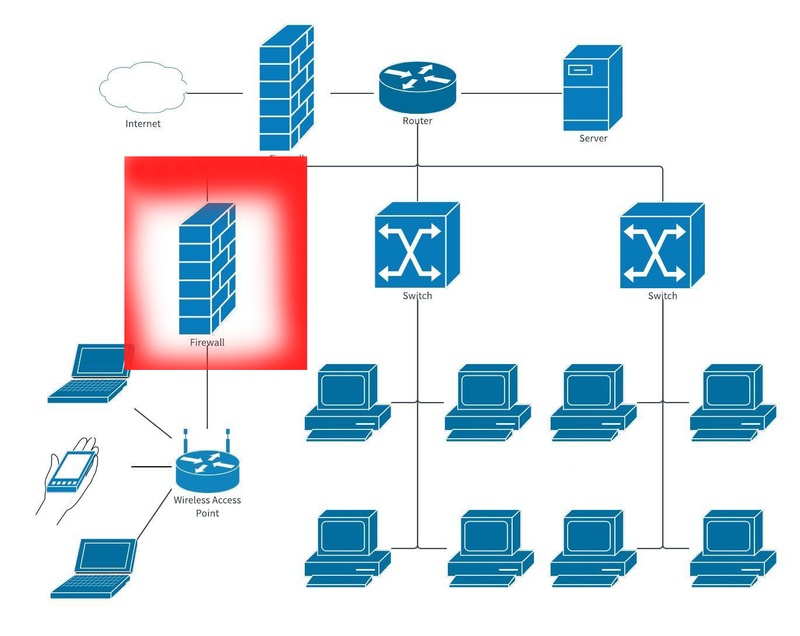 Do I need two firewalls (one for LAN, one for WLAN Access point) like the image shows or is it enough, if I just use the firewall before the router? Do I really need the one I marked with red? Is that marked firewall just for setting more filters, or would there a bigger purpose for it? This answer borrows ideas from Steffen's comment. The answer is it depends, with a sprinkling of random internet people don't know enough about your organization to give a proper answer. But we can give you some points to think about. As Steffen said: "Firewalls are used to separate things", usually to protect a higher-security group of users and / or devices from a lower-security group. only ever connected a clean packet-inspected network with other similarly trusted devices. TL;DR: You need to have a think about what your organization's security and threat models are. If you decide that the phones and laptops really truly have exactly the same security needs and risk level as the servers and desktops, then you don't need a firewall there. However, in 99% of organizations, devices that are allowed to leave the building are considered to be at higher risk of infection, so it makes sense to have that firewall and only allow through the hosts and ports that the laptop users actually need to access. The idea is to assume the laptops and phones are infected and reduce the amount of network probing that they can do on your internal network. Anything more i can do to be more safer?